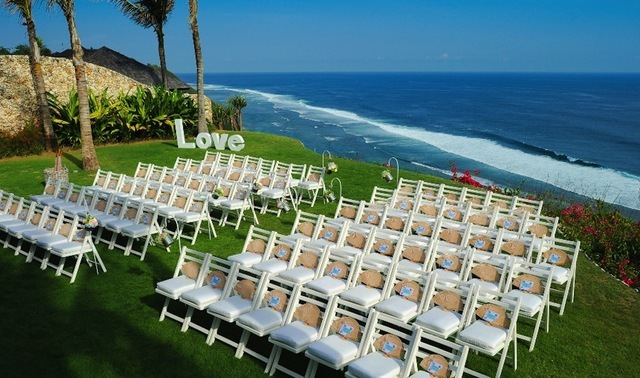 Bali, the Island of the Gods, is a stunning tropical paradise located in Indonesia and with it’s incredible beaches, beautiful temples, jungle-covered mountains and luxurious resorts, it is the perfect place for your dream wedding. Bali offers so many options for weddings, with packages for couples only through to larger weddings with family and friends in attendance. We have sourced the best wedding packages available from all around Bali, and by working with you and establishing your wedding needs, we can tailor these packages to create a bespoke wedding based on the budget that suits you. For couples that want to celebrate their love by creating an intimate wedding for two, we recommend our secret beach wedding package. 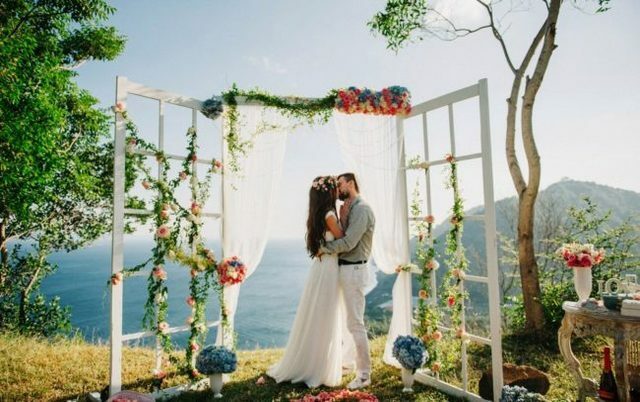 Imagine just you and your love standing on a beautiful beach, the waves gently rolling in, the scent of flowers filling the air, during your ceremony and then being whisked away to a private villa or resort to celebrate with fine dining and a beautiful romantic holiday? Our team are on the ground in Bali and have found the most beautiful and private beaches for intimate ceremonies and we also work with the local businesses for your reception and honeymoon – so we can guarantee the utmost care and professionalism, while creating your bespoke wedding package at a budget that is just right for you. You may choose to have an intimate wedding but invite a small group of guests to join you in celebrating your marriage. We have packages that allow you ultimate privacy on your day, in fabulous locations, but with room for your wedding party and guests to attend. With stunning backdrops for the wedding photographer to capture the special moments, your day will be fully catered to – from the ceremony, to reception, the accommodation, hair and make up, a cake, gifts… anything your heart desires for your special day in paradise. We can also help with arrangements for a larger wedding. Many people choose to have weddings and holidays in tropical locations and their guests continue on with their own holiday. We can create packages to encompass all arrangements and ensure your day and time with your guests runs smoothly and to budget. For large weddings, we have a beautiful location in manicured gardens set on the beach – so you can enjoy a tropical beach wedding for your ceremony with the reception set in the most idyllic gardens. We can arrange all aspects of the day and your holiday, including the catering, ceremony, decorations, guest arrangements, music, flowers, candles, gifts and so much more. In fact whether you are planning a private wedding, a small wedding or a larger wedding in Bali, we can offer you a planning process that covers every single aspect and based on your planned budget – so your dream day is perfection in every sense! We welcome you to browse through our packages online, write down the details you love and create a list of special extras just for your wishes. Contact one of our online consultants who can start the planning process by discovering more of what your ideal day looks like and then one of our highly professional and qualified team will be in touch to create the package that will become your perfect wedding in Bali.